With measurement of Lavg and LPeak, the CEL620B Sound Level Meter is ideal for occupational noise assessments. The CEL620B2 is a Type 2 Integrating Sound Level Meter, making it ideal for most occupational and general purpose noise assessments. It can also be used for more detailed noise surveys that require frequency analysis using Octave Band Filters. This is a data logging meter, so it can store measurements for download to a computer. Software is included in the rental kit, or you can even transfer the measurements into Excel or similar spreadsheet without installing any software at all. When measuring unsteady noise with a standard (non-integrating) sound level meter you have to average the level by eye. An Integrating Sound Level Meter takes away the guesswork and does the averaging for you, providing you with parameters such as the Lavg. This is the meter that we recommend for occupational noise measurements due to its averaging feature and measurement of Peak sound level. This sound level meter is the correct specification for all occupational and noise at work assessments being carried out in line with the OSHA, MSHA ACGIH and NIOSH guidelines. These regulations require the use of a sound level meter that meets the ANSI S1.4 standard to Type 2. 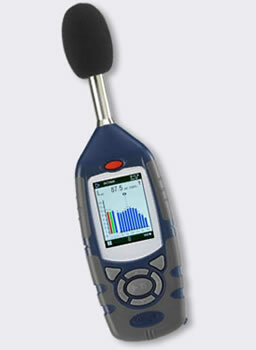 It is also beneficial to have an Integrating meter and to be able to measure the Peak sound level. The Octave Band Filters are not essential but can be used to carry out more detailed checks to ensure that the hearing protectors available are adequate. For this reason we always include the octave band filters feature with this meter. The CEL620B2 is suitable for any general purpose noise measurement that demands the use of a Type 2 Sound Level Meter or Type 2 Integrating Sound Level Meter. If your measurement guidelines don't mention standards then this meter should also be adequate, but please check with us first if you have any doubts. Most occupational noise regulations state that the meter's calibration should be checked before and after making measurements. Put the Calibrator on the mic. and select the Calibrate option. Keep a record of all calibrations (done automatically if you are downloading to a computer) to meet the noise regulations. Press the Run/Stop key to start a measurement. Once the measurement is complete (e.g. the Lavg average level has settled) press the Stop key. The rental kit includes software for downloading and reporting. If you don't want to install software then you can just plug the meter into your computer's USB port and it will act like a memory stick. Measurements can be copied straight from the meter and loaded into Excel, Word or similar software.